For this work the 1:50 000 Edinburgh, Falkirk, Airdrie, Aberfoyle, Ben Lomond and Stirling BGS superficial (drift) maps were used. These maps show the distribution of a Devensian-aged raised marine deposit, Holocene raised intertidal deposits, till and glaciofluvial deposits surrounding the Firth of Forth and River Forth. The Late Devensian post-glacial marine limit was deduced by the inland limit of mapped ‘Devensian-aged raised marine’ deposits. These deposits are distributed from Edinburgh to just west of Stirling. Using a combination of Nextmap DTM and ordnance survey maps the marine limited was correlated between mapped outcrops based upon height and topography. This interpretation is shown in Figure 1 with the interpreted Devensian palaeocoastline based upon the mapped outcrops shown as a black line and the interpreted palaeocoastline based upon height as a blue line. 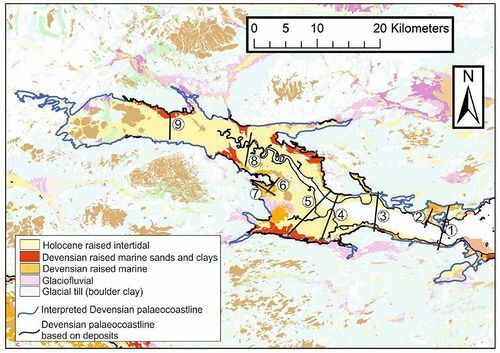 Figure 1 Overview maps of the Firth of Forth showing the mapped Devensian raised marine deposited and the interpreted Devensian Palaeocoastline. In addition, cross section lines are shown, that later described including at the: 1) Forth Road Bridge, 2) Rosyth, 3) Bo’ness, 4) Grangemouth, 5) Skinflats, 6) Plean, 7) Chartershall, 8) Stirling, and 9) South-west of Doune. Contains Ordnance Survey data © Crown Copyright and database rights . The BGS single onshore borehole database (SOBI) which contains records produced by geologists or geotechnical engineers from drilling and site investigations. Boreholes used in this work range in depth from several metres to over a hundred metres. The various lithologies described in the boreholes have been coded based on the BGS unlithified deposits coding scheme (Cooper, Kessler, & Ford, 2006). These coded borehole records can imported into the BGS Groundhog software, where the borehole records can be viewed as logs and used to develop 2D cross sections. Nine cross-sections were drawn in BGS Groundhog from the Forth Road Bridge up to Thornhill, on the edge of Loch Lomond and Trossachs National Park (Figure 1). These cross sections are generally orientated north to south. The aim of developing these cross sections is to combine data from superficial maps, borehole records and the BGS superficial thickness model to understand changes in composition and thickness of superficial thickness across the estuary. ↑ COOPER, A H, KESSLER, H, and FORD, J. 2006. A revised scheme for coding unlithified deposits (also applicable to engineering soils). British Geological Survey, IR/05/123 (Keyworth).